Dispersion (Spread or Scatter) To distinguish between the distributions (1) and (2) some measure of dispersion or scatter is required. Various measures of dispersion are available. The RANGE of a set of observations is the difference between the greatest and least of the observations. It is easy to calculate and is widely used in industrial quality control as one check on manufactured items. However, it ignores the distribution of the observations between the extremes (eg possible concentrations about the centre) and is too easily affected by freak results. For example: 2.3 4.1 5.2 6.9 8.8 9.4 have range = 9.4 - 2.3 = 7.1. Again this is fairly easy to calculate, is not so easily affected by freak results and is useful for comparing the dispersion of similarly shaped distributions. Ideally, a measure which uses all the observed data to calculate some average deviation from the centre of the distribution would be preferred to both of the above quantities. Expression (1) is the standard deviation of a set of data values which constitute the totality of those values in which we are interested, ie the population. As already mentioned we are rarely able to study the population exhaustively so s can not often be calculated. Calculating s from all possible samples from a given population and then finding their average produces a value which is smaller than the population standard deviation. Consequently expression (1) is said to produce a biased estimate of the population standard deviation. 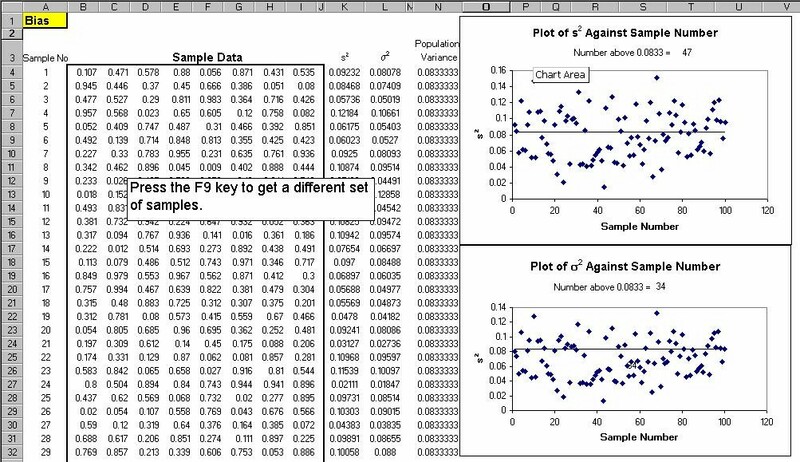 It can be shown that changing the divisor n in expression (1) to n-1 to give expression (2) produces an estimate the standard deviation of a population, of which the n data values are a random sample, which is unbiased. Consequently s is the value usually calculated. Some texts use instead of s for expression (2), the symbol denoting that the quantity is an estimator. Some calculators represent expression (1) by and expression (2) by whilst others actually use and s.
Use your calculator to confirm that s, the estimated standard deviation of the population from which this sample is taken is = 2.40 microns. As a measure of variability the standard deviation has magnitude which depends on the magnitude of the data. The COEFFICIENT OF VARIATION expresses sample variability relative to the mean of the sample. Since s and have the same units, V has no units at all, a fact which emphasises that it is a relative measure.